Studying for a Master of Business Administration and traveling the world might seem to be divergent paths. But just ask around at Florida Atlantic University and you'll find those who do both as part of FAU's International Field Study Tour, a program for MBA students with an International Business Specialization. And you'll hear about how seeing businesses abroad firsthand is a game changer in their education. Kevin Ryan says his trip to Vietnam and Malaysia in 2014 revealed a fascinating side of the business world. "I was born in Ireland, so I'd been to a lot of places in Europe, but never Southeast Asia," says Ryan, who graduated with an Executive MBA in 2014. "It was a very eye-opening experience." This trip proved to be educational not only on a business level but a cultural one, as well. It's easy to assume that business is business no matter where it takes place. But successfully working with international companies is about more than Googling the local translation for "Excel spreadsheet." The MBA students who sign up for an FAU international trip experience all the similarities and the extreme differences of how businesses operate. That's partly why the College of Business's International Field Study Tour counts as one class toward an MBA with an International Business Specialization. (Afterward, students write a paper based on their visits to foreign companies.) And, in addition to meeting executives, students make cultural visits, which provide a better understanding of the host country. In Vietnam, for example, Ryan stopped at the War Remnants Museum, which houses artifacts from the Vietnam War. "It was interesting to see (the Vietnamese) view of the war," says Ryan, who points out that the museum highlights the communist victory in 1975. Such cultural excursions give students a broader context when interacting with various businesses. "We went to a UPS office and met with an Australian who ran that operation, and visited a Norwegian shipbuilding company, which gave us an idea of how much things have changed," Ryan says. Although Vietnam is attracting more international interest and becoming more open, Ryan's group encountered some resistance during the second leg of their trip, in Malaysia, where they met a leader at the May Bank. "We were taken aback because he acted as though we were a group of high school students (even though) we were well-dressed and asked a lot of detailed finance questions," Ryan says. The respectful yet smart showing by the FAU group had put May Bank officials on the defensive. "They held everything close to the vest." That's just one of countless stories past participants of FAU's International Field Study Tour could share; it's never the same trip or experience twice. Some years students get to vote on destinations, other years they're presented a few options to choose from. A professional tour company coordinates each trip, and students stay in four- or five-star hotels and work with guides during their travels. 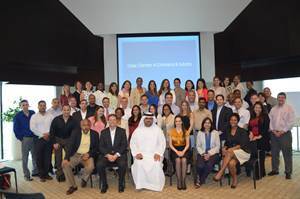 In 2013, MBA students traveled to India and the United Arab Emirates. "We visited local subsidiaries of multinationals such as Coca-Cola and SAP," says Pradeep Korgaonkar, Ph.D., a marketing professor at FAU. They also stopped in on local companies, including a hospital well known for its medical tourism initiatives. In the UAE, the group encountered a wealthy culture with superb infrastructure and modern comforts — not unlike the U.S. in that way. "But it was significantly different as (the country) is ruled by a king and not a democracy, and Muslim religion provides the governing principles," Korgaonkar says. "The experiences allowed business students to gain valuable insights not available at home." And those insights are crucial, especially for the MBAs who want to go on to do business overseas. The international trip gives them an appreciation for how to prepare when executives on the other side of the table operate under different laws and observe very different customs. "Students become more cosmopolitan and develop more understanding and respect for other cultures," Korgaonkar says. "It gives them a competitive edge in the job market." Ryan agrees even though he had already traveled extensively in the past. "(The trip) was about seeing how big the world is: South Florida is a speck compared to what's there on a global level," he says. "Seeing the striking differences between peoples and cultures was incredible." He sums it up this way: "It was the trip of a lifetime, and besides graduating, the highlight of my program."